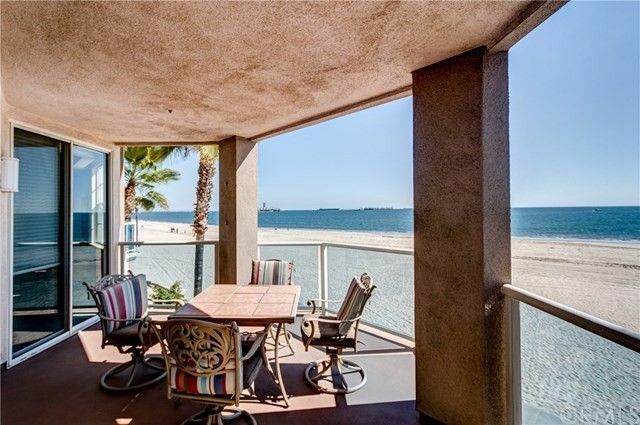 Absolutely stunning views of the blue Pacific and gentle rolling waves act as your backdrop in this beach front, end unit location with full wrap around covered balcony! This is the Premiere home in the highly sought after 1500 Ocean beach front complex! This open floor plan is the largest in the complex and offers walls of windows to enjoy your panoramic ocean front views and allow for plentiful natural light! This fantastic unit offers one of the largest full wrap around and covered decks in the complex that is perfect for outdoor dining, relaxing and enjoying the sights and sounds of the ocean right outside of your new beach front home. Tasteful upgrades include: a remodeled kitchen with stunning real wood cabinetry with European hinges and pulls, granite counter tops, master Jacuzzi tub, custom travertine floors with a hand inlayed medallion mosaic, crown molding, upgraded carpet, Hunter Douglas automatic window treatments, master bedroom cedar lined walk in closet and more! Pool, gym, spa, sundeck, rec.room, direct beach access, bike storage and additional private storage room! This is a must see!